Saddleback wanted to provide geoscientists with a multi-platform based solution for solving difficult exploration and exploitation problems that could be characterized by modeling, petrophysical analyses, rock-physics, and seismic studies. Thus, Saddleback needed to provide best-in-class algorithms along with new ways to integrate R&D tools, processing flows, and automation while retaining the ability for their clients to customize Saddleback’s tools and workflows for their diverse needs. Saddleback knew that their unique advantage lies in the originality of their science and the quality of their results. Therefore, they did not want to spend unnecessary effort and capital re-inventing what others had done before, and instead searched for a fully supported, industry-accepted data visualization platform that allowed for rapid deployment of new ideas and workflows. Saddleback chose INTViewer, our innovative visualization platform for data analysis and QC. Designed for exploration geoscientists, INTViewer is powerful, yet easy to learn. Users can easily visualize complex data and attributes and quickly discover patterns or trends. INTViewer offers sophisticated controls, in an intuitive and logical manner, with minimal onboarding. Built on the Oracle® Netbeans Java Rich-client-platform (RCP), INTViewer also provides a standards-based plugin framework for adding custom utilities and proprietary R&D via a comprehensive API for access and control of menus, data, and custom displays. This was a perfect solution for Saddleback as their custom data processing algorithms, workflows, and data formats could be easily implemented as plugins. 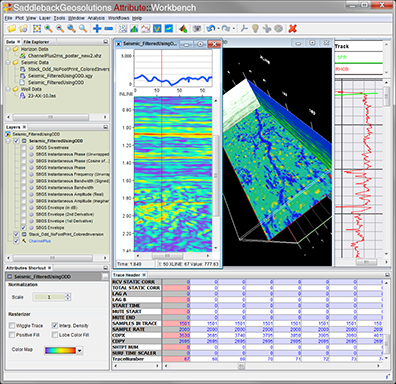 Saddleback utilized the INTViewer platform to develop and deploy Attribute::Workbench with a host of new seismically derived attributes, meta-attributes that correspond to the morphology and ontology of the basic forms of the attributes, spectral decomposition tools, seismic inversion, and other tools used to examine the tie between rock physics and attributes through synthetic seismograms (allowing better reservoir property), and through geostatistics (allowing for better validation at well locations). Saddleback successfully deployed their new Attribute::Workbench in a fraction of the time it would have taken to create a new system from scratch because they were able to take advantage of the application infrastructure provided by INTViewer and focus their resources on the development of advanced algorithms and tools. SaddlebackGeosolutions offers a full range of geophysical services and consulting from quantitative analysis to application development and technology management. SBGS employs, and has joint-ventures with, industry leaders in volume rendering and visualization, analytics, and all aspects of rock physics, seismic-petrophysics, seismic interpretation and hydraulic fracture monitoring. Learn more at www.sbgeo.com.